Overlord lets you select which of your calendars to include (eg. local, synced, birthdays, et cetera), along how far forward and back the Overview screen should include. You can choose the day to start your weeks on in Month View, and set the clock mode to either your phone’s default, or force 12- or 24-hour mode. 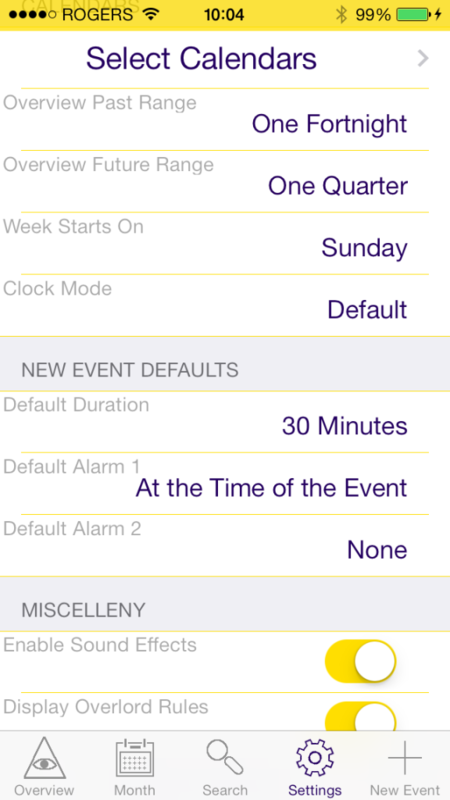 Defaults for new events are straightforward, and you can toggle sound effects and the Evil Overlord rules on and off. Settings also includes a Help / About link, if you scroll down to it.